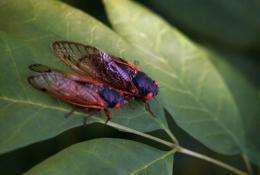 Two cicadas sit on a leaf at a forest preserve in Willow Springs, Illinois. The extravagant headgear of small cicada-like bugs called treehoppers are in fact wing-like appendages that grew back 200 million years after evolution had supposedly cast them aside, according to a study published Thursday in Nature. The extravagant headgear of small bugs called treehoppers are in fact wing-like appendages that grew back 200 million years after evolution had supposedly cast them aside, according to a study published Thursday in Nature. That's probably shocking news if you are an entomologist, and challenges some very basic ideas about what makes an insect an insect, the researchers said. The thorax of all insects is by definition divided into three segments, each with a pair of legs. In most orders, there are also two pairs of wings, one on the middle segment of the thorax and another at the rear. Other orders such as flies and mosquitoes have only one set of wings, at the rear, and a few -- most ants, for example -- have no wings at all. But no insects today have functional flappers in the first segment next to the head. "Primitive insects 350 million years ago had wings on all of their body segments," said Benjamin Prud'homme, a researcher at the Development Biology Institute of Marseille-Luminy in France and lead author of the study. "We don't know if they were all for flight, but we do know -- from fossil records -- that these wing-like structures were present on each and every body segment." Over the next 100 million years, he explained, wings on the first segment of the thorax and the abdomen dropped away entirely. But then, some 50 million years ago, something strange happened to the cicada-like treehoppers: they once again sprouted wing-like structures from the top of the first segment of the thorax. Some of these wildly divergent extrusions resemble thorns, others look like antlers, and still others like aggressive ants or animal droppings, creating one of Nature's most exotic menageries. Experts had long assumed that these so-called "helmets" were armour-like expansions of the insects' exoskeletons. But by carefully observing the treehopper's development into adulthood, Prud'homme and colleagues showed that this headgear began as a pair of buds -- attached at the sides, and articulated like wings -- that fused together as they grew. Evolution is usually described as linear, but these modified wings suggested the process had come full circle. "This is the only known example of a modern insect that has grown a third pair of wings," Prud'homme said by phone. "It is a modification of the basic body plan of insects." Just how this happened remains a mystery. For 200 million years, certain genes prevented wing-like structures from emerging on this part of any insect's anatomy. The researchers speculated that these genes had lost their inhibiting capacity, but experiments on other insect species demonstrated that their repressive powers remain intact. However it happened, the evolutionary process found a way to put the renewed appendages to use, the researchers speculate. "This extra pair of wings was not needed for flight, but nor did it prevent it," Prud'homme said. "So it became raw material for evolution to play with." Many of the helmets appear to serve as camouflage, helping the insects to avoid predators. The study shows "how development abilities can be lost or silenced over millions of years, only to be redeployed to contribute to the evolution of a complex and beautiful appendage," commented Armin Moczek, a professor at Indiana University, also writing in Nature. Body plans, which characterize the anatomical organization of animal groups of high taxonomic rank1, often evolve by the reduction or loss of appendages (limbs in vertebrates and legs and wings in insects, for example). In contrast, the addition of new features is extremely rare and is thought to be heavily constrained, although the nature of the constraints remains elusive2, 3, 4. Here we show that the treehopper (Membracidae) helmet is actually an appendage, a wing serial homologue on the first thoracic segment. This innovation in the insect body plan is an unprecedented situation in 250 Myr of insect evolution. We provide evidence suggesting that the helmet arose by escaping the ancestral repression of wing formation imparted by a member of the Hox gene family, which sculpts the number and pattern of appendages along the body axis5, 6, 7, 8. Moreover, we propose that the exceptional morphological diversification of the helmet was possible because, in contrast to the wings, it escaped the stringent functional requirements imposed by flight. This example illustrates how complex morphological structures can arise by the expression of ancestral developmental potentials and fuel the morphological diversification of an evolutionary lineage. Does this show that de-evolution is possible? Meaning, we can evolve "backwards"? "Evolution in reverse" is quite the misleading phrase. At one point in the insect's history, it evolved wings, then for some reason it lost the wings; then, later, those wing-parts were used for something else. It's whatever was best for the insect at that time. Evolution doesn't go "backwards" or "forwards"; there's no end goal, no ultimate victory. Evolution just does whatever is best at the timethat's the whole point. The Power and tendency, the genetic and systemic course of adaptation in living organisms on a living planet. Evolution is response to the changing demands of a living world...NOT the reason for existence or the cause of change - this little creature is demonstrating this fact with its own life and lineage. Evolution is the living expression of change by living things subject to outside forces. We all ADAPT. IMO, that simple phrase should be the criteria and definition for life, the ability to adapt; would make classifying and the giving of rights to AI a lot easier as well (whenever that happens). 'Adapt' is too active a word here. Evolution doesn't mean that the individual adapts. Evolution is a passive process in which the unfit have a better chance to die and those that just happen to be mutated in a way that is a better fit have a better chance to survive. It's more like "Oh sh*t look at that freak over there with the flippers hahaha OH SH*T I AM DROWNING OH GOD SAVE ME FLIPPER BOY". Under intense reproductive inbreeding, under the most controlled environment, lacking predation or rampant disease, living systems amend themselves to their closed environments; They Adapt. Evolution is our 'brother' not our 'parent'. the point I'm trying to make here is that evolution is the process by which the envoronment adapts us - not by which we adapt to the environment. The distinction is small but crucial (especially inthe light of people who claim that evolution is guided or has an ultimate goal or even a definite direction): Adaptation by us would mean that we choose a path to go. Adaptation by the environment means that it weeds out the unfit and promotes the fit while we (or better: our offspring) just mutate around the mean. "the point I'm trying to make here is that evolution is the process by which the envoronment adapts us - not by which we adapt to the environment. Adaptation by us would mean that we choose a path to go." I 100% agree in what you said but our current definition of life is limited to organic species only which is why I think the ability to adapt is a better criteria for life. I have thought about it enough to talk to some of my professors with mixed results. But hey, it's a work in progress. With this definition, a virus, android and any organic species would be considered life. By the ability to adapt I mean when presented with situation A we can change something about ourselves to survive within situation A, whether it is a massive flood or new virus it does not matter. Where as evolution is more like our O2 levels are decreasing which in turn some of us might evolve to better absorb O2 from the atmosphere. Both are a form of adaption that nothing not alive can do. A computer can't change itself if it is damaged or has to run on less power. As a side note, some organic compounds could be argued to be alive by definition. That seems to be where people draw the line. inorganic life? tell us what your thoughts are! A virus by its own functionality, is a virus because IT CANNOT be alive outside a living cell. It will never be a virus and have an independent life. What definition are you referring to? Please enlighten, name, one organic compound, not a cell or virus, an organic compound that uses genes or DNA to make copies of its' self. Not fragments of its self broken off by an outside process, but, copies of itself from evident reproductive processes, please? Stop thinking linear folks. Evolution will go anyway it can. it will do loop-de-loops if possible. Everything I said was based on the premise of life is something that can adapt. Therefore under that definition a virus would be considered to be alive. A virus cannot reproduce outside a living cell but they can survive outside a cell. Using the standard definition of a virus they are not alive, mainly that is because they need another organism or cell to reproduce. Obviously there are no organic compounds that use DNA... But as you missed the point of that post I'll leave it at that. Basically what I am saying is that our basic biochem has been able to develope in our current environment and that it can be argued it is alive on the premise of the ability to adapt. But it is more an interesting thought experiment with concern to how alive are organic compounds. My main focus was on the definition of life.